Asia is full of amazing destinations and the Philippines is one of them – it is relatively cheap and has an amazing culture. With this All Nippon Airways flight leaving and returning in November you can fly from Newark to Cebu for $794 r/t with taxes included. Book with this airline and save hundreds on your airfare compared to other airlines. Cheapoair provided this Cebu airfare deal but our deal hunters have found it on Travelgrove. Check these sites but keep in mind that the more merchants you compare for similar deals the higher the chance that you will find the best flight. Start your trip from Newark Liberty International Airport (EWR) on the 17th of November and return on the 25th from Mactan – Cebu International Airport (CEB). The flight has a 4 hour 40 minutes stop in Tokyo on the way to Cebu and a 4 hour 30 minutes one on the way back. ANA Mileage Club, the frequent flyer program All Nippon Belongs to, will give you 12,516 award miles for booking this airfare. 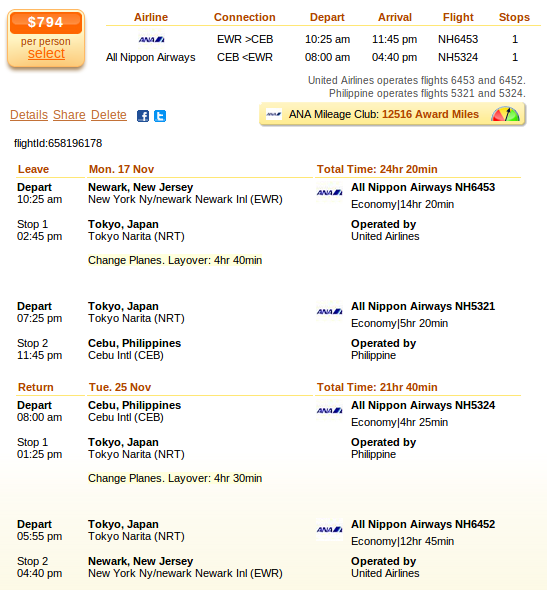 You can save exactly $343 compared to the second cheapest deal if you book All Nippon’s flight deal. See all the best fares we have found in the table. This entry was posted on Thursday, October 23rd, 2014 at 12:35 am and is filed under Airfare Deals. You can follow any responses to this entry through the RSS 2.0 feed. You can leave a response, or trackback from your own site.